These hooded custom jackets offer on trend color-blocking to make a bold statement while highlighting your brand. The women's Sport-Tek Custom Wind Jacket has a gently contoured silhouette and sporty look. The Port Pocket at left chest allows easy embroidery access to display your logo, team or event. The heather texture and raglan sleeves gives this Sport-Tek Custom Wind Jacket a sporty and youthful look! The Port Pocket at left chest allows easy embroidery access to display your logo! Separate yourself from your competition by imprinting your logo on these great Sport-Tek Heather Colorblock Contender custom polos that features a great pop of color to grab attention. Make your brand stand out from your competition by imprinting your logo on these great Sport-Tek Heather Colorblock Contender custom polos that features a great pop of color to garner attention. The Sport-Tek collection ranges from promotional performance apparel to athletic heritage and casual streetwear. 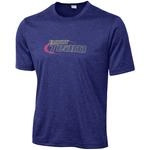 Sport-Tek â„¢ is the perfect custom apparel for schools, teams, resorts, community organizations and the corporate world.